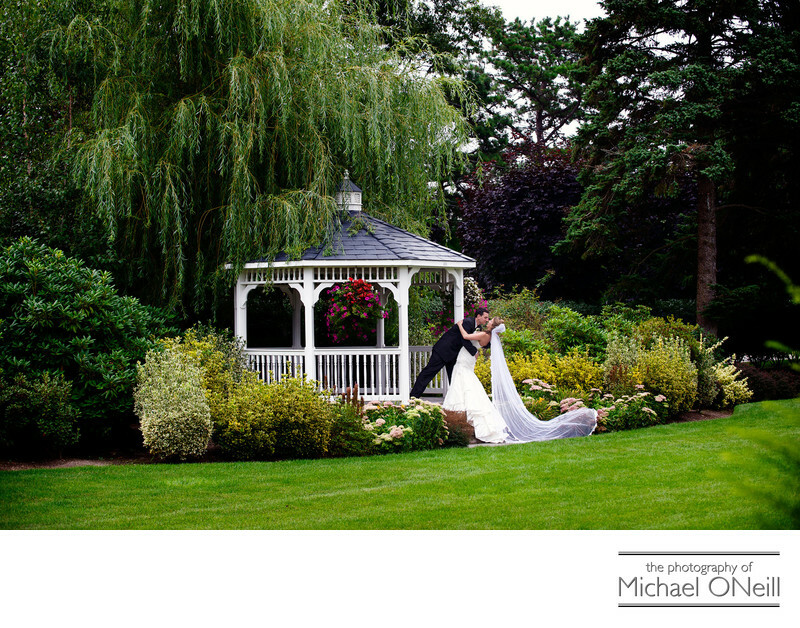 This fine wedding photograph was taken on the grounds of East Wind Caterers in Wading River, New York. East Wind is such an amazing venue featuring their awesome hotel and catering facility, The Inn at East Wind; The spectacular Estate at East Wind, a separate catering facility for large scale events; and finally, The Cottage at East Wind, perfect for smaller gatherings. All of the three establishments are located on a common piece of real estate that is meticulously maintained. No matter which of the three catering venues you choose you will be surrounded by sprawling lawns, beautiful gardens and elegant architecture. In my many years as a Long Island professional wedding photographer I have had the experience of working at all of East Wind’s offerings on many occasions. From the outdoor gazebo pictured here to the grand stairway in the lobby of The Inn, East Wind offers incredible opportunities for great wedding pictures. If you are planning a wedding at any of the three East Wind catering facilities give me a call to discuss your plans and wishes for the big day.